As a business owner or marketing manager, you've probably been told: "Why don't you just market your business online?" While the internet has given you the opportunity to reach potential customers around the globe, it's also given your competitors that same opportunity. You are still struggling to be seen and heard, just through a different medium than before. So how do you put your business in front of the people that need your services? How do you target the customers who will benefit from working with you? And how do you develop products, services, and messaging that will appeal to your market? "Who is my ideal customer, and what are their pains?" What Is a Buyer Persona (AKA Target Buyer)? As a business owner you may be tempted to answer the question "Who is your ideal customer?" with the response: "Everyone." While your product may truly benefit every human being that uses it, not everyone is your ideal customer, and by identifying the person that is, you can tailor your marketing, your copy, and your sales pitches to them. This is why you must create a buyer persona of your ideal customer or target buyer. This buyer persona serves as a fictional representation or avatar of the person most likely to buy from you. It can include their demographics and how they behave online, their personal histories, and their concerns. What motivates them to buy? What are their pain points? What stage of the buying process are they in? Once you know who you are marketing to online, you'll be able to create a successful online marketing strategy. Consumers are in control of the buying cycle today. Consumers don’t need to call you with questions because the internet allows them to access all the information they need. Consumers hate being sold to, but they LOVE to buy. The minute you accept these as true, you’ll be ready to see your marketing through a new lens that can shape your company’s growth. When you create a crystal clear buyer persona for your business, it makes communication, product or service development, marketing, and sales much easier. The true power in developing a buyer persona comes from understanding your customers. The better you understand them, the better you can attract them and serve them. This includes not just who they are, but what stage of the sales cycle are they in. It stands to reason that the better you understand your potential client, the easier it will be to talk to them. When you are clear on your avatar, you'll be able to craft messages for your online materials that have your potential customer saying, "Wow! It feels like they're talking directly to me." Awareness Stage: They are experiencing symptoms or discomfort that signals to them that a problem must be solved. Consideration Stage: They know the problem needs to be solved, and they begin to research potential solutions. Decision Stage: They know the problem and how they'd like to solve it. Now you must convince them that your product will work the best. If you've been in business for more than 10 minutes, you've likely discovered that there are some customers you love working with. They are easygoing and fun to collaborate with, pay you on time, don't argue over the price, have a similar work ethic and culture, and working with them barely feels like work at all. They are profitable, they are pleasant, and you are happy. And then there are those other customers. You could call them the "bad apples." They don't want to pay you what you're worth, they monopolize your time, they question you every step of the way, and working with them is like having your teeth pulled... without anesthesia. When you sit down and identify both types of customers, you'll identify your target buyer (and know who to stay away from). Once you identify your target audience, taking the steps to market to that particular individual becomes much easier. There are a variety of ways to gather the necessary information to build your buyer personas. The easiest way to begin the process is to look at your existing customers and contacts and then look for commonalities. Are they all the same gender? Next, you can interview your customers in person or over the phone. Ask them what they enjoyed about your service and what they would like you to improve on. You can also review any testimonials or reviews that were written about your service. Pay close attention to what aspects of working with you they touch on. If it was important enough for them to comment on, chances are other customers will care about that as well. You can also include questionnaires on your website or during your onboarding process to ask pertinent questions about who they are, what problems they are looking to solve, and how they found you. Finally, talk to your employees and any outside partners that you work with to determine what types of customers they see and how you can make generalizations about them to understand individuals better. This demographic profile allows you to understand where and how they are living. The best way to get this information is to simply ask your existing customers. You can also use online surveys to gather data. However, a buyer persona should go one step further by including psychographics, or the mental characteristics that make up your ideal client. Background questions: What do they do? What are their career aspirations? What does their family look like? Demographic Questions: Gender? Age? Income? Where do they live? Goals: What would they like to accomplish? When this happens, converting new customer leads will become easy. Sometimes you may feel as if your marketing attempts are falling on deaf ears. Rather than wasting your time, energy, and dollars on shouting to no one in particular, it's time to get very clear on who you want to work with (and who you want to avoid). By understanding what motivates your ideal customer to take action, you'll be able to speak directly to them and provide the products or services that will make a difference in their life or business. While it's important to understand the demographics of your ideal customer, you'll also want to pay close attention to the psychology of your avatar. Download our empathy map exercise you truly get into your potential customer's mind. Done right, you’ll have the best insight into the content you should have on your website, blog, social media posts, and offline marketing collateral. Your online marketing efforts becomes a breeze when you know who you're marketing to. 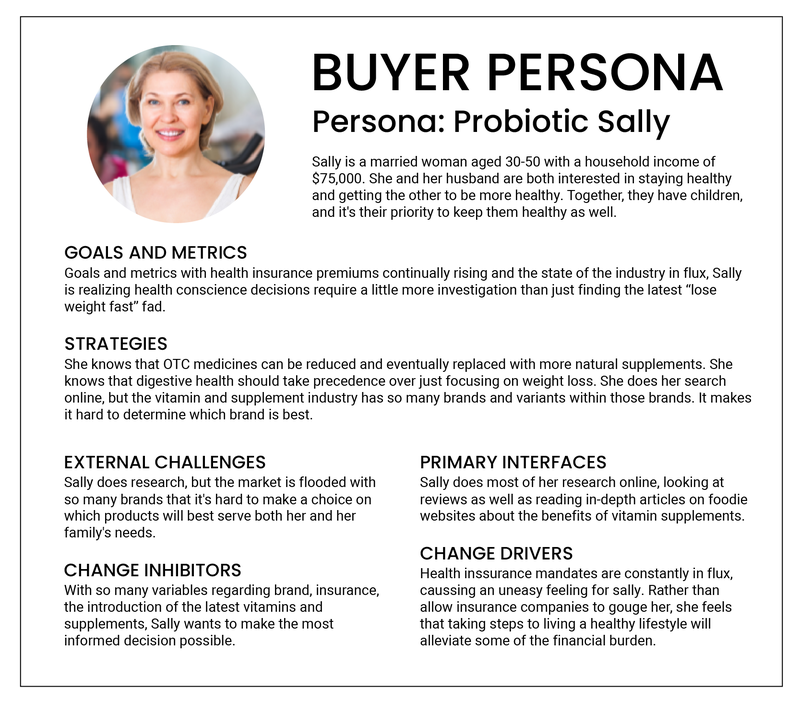 Need help with creating creating these personas, download our in-depth buyer persona template below!